he Cyrus Cylinder is one of the most famous objects to have survived from the ancient world. The Cylinder was inscribed in Babylonian cuneiform on the orders of the Persian King Cyrus the Great (559−530BC) after he captured Babylon in 539 BC. It is often referred to as the first bill of human rights as it appears to permit freedom of worship throughout the Persian Empire and to allow deported people to return to their homelands. It is valued by people all around the world as a symbol of tolerance and respect for different peoples and different faiths, so much so that a copy of the cylinder is on display in the United Nations building in New York. This catalogue was published in conjunction with the first ever tour of the object to the United States, along with sixteen other objects from the British Museum’s collection, including some drawn from the Oxus Treasures. The book discusses how these objects demonstrate the innovations initiated by Persian rule in the Ancient Near East (550 BC−331 BC), a prime example being a gold plaque from the Oxus Treasure with the representation of a priest that shows the spread of the Zoroastrian religion. The book offers a new authoritative translation of the Cyrus Cylinder by Irving Finkel and the publication of two fragments of a cuneiform tablet that show how the Cyrus Cylinder was most probably a proclamation and not just a foundation deposit. 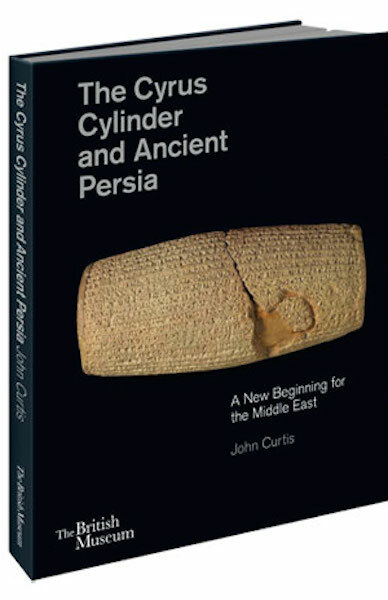 Dr John Curtis is a leading scholar and a pioneering archaeologist specialising on the history of the Middle East and particularly ancient Iran with more than 100 published articles and 20 books. He was appointed a Research Assistant in the Department of Western Asiatic Antiquities (now Middle East) in 1971, becoming Assistant Keeper in 1974 and Keeper in 1989; he joined Iran Heritage Foundation as its Chief Executive Officer (CEO) in 2014. Dr Curtis is mainly interested in the archaeology and history of Iraq and Iran circa 1000-330 BC. Between 1983 and 1989 he directed excavations on behalf of the British Museum at eight different sites in Iraq, including Nimrud and Balawat. Since becoming Keeper he has overseen the installation of six new permanent galleries at the British Museum. He has also curated the traveling exhibition Art and Empire: Treasures from Assyria in the British Museum that has been sent to nine venues worldwide, and the special exhibition Forgotten Empire: the World of Ancient Persia at the British Museum September 2005-June 2006, that attracted 155,000 visitors. He was elected a Fellow of the British Academy in 2003 and awarded an Order of the British Empire (OBE) in 2006.